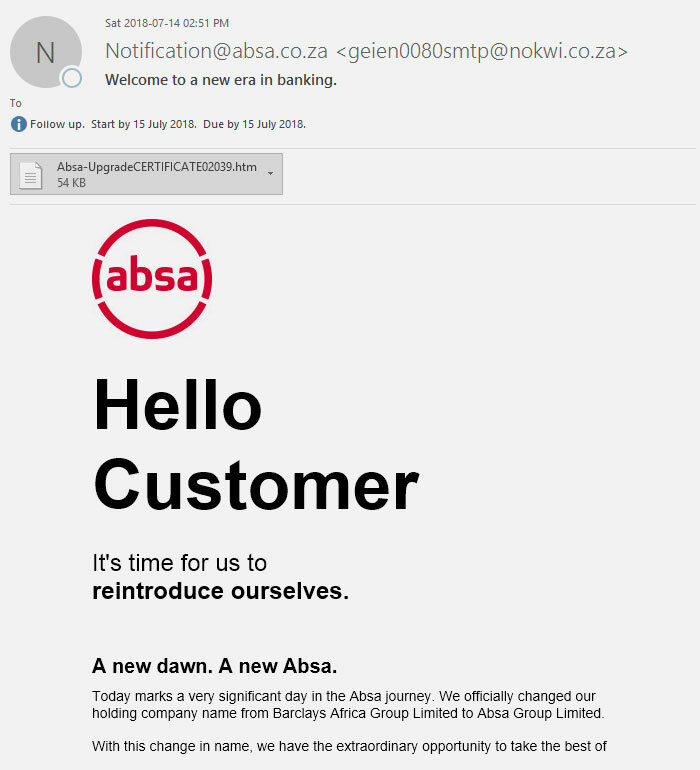 Cyber criminals have wasted no time in using Absa’s new logo to target the bank’s customers in email scams. In a phishing email sent to South Africans, the criminals are trying to capitalise on Absa’s rebranding to catch unsuspecting users. The email – which purports to come from Absa CEO Maria Ramos, but comes from the email “geien0080smtp@nokwi.co.za” – informs victims that “today marks a very significant day in the Absa journey”. The email then punted Absa’s slogan, saying “We are also launching a new, fresh and vibrant Absa logo and identity that reflects our commitment to you, our customers”. Users are then encouraged to click on their “New Absa eStatements” in PDF format, which is actually an HTML file that takes users to a phishing attack website. A screenshot of the new-look Absa phishing attack email is provided below.